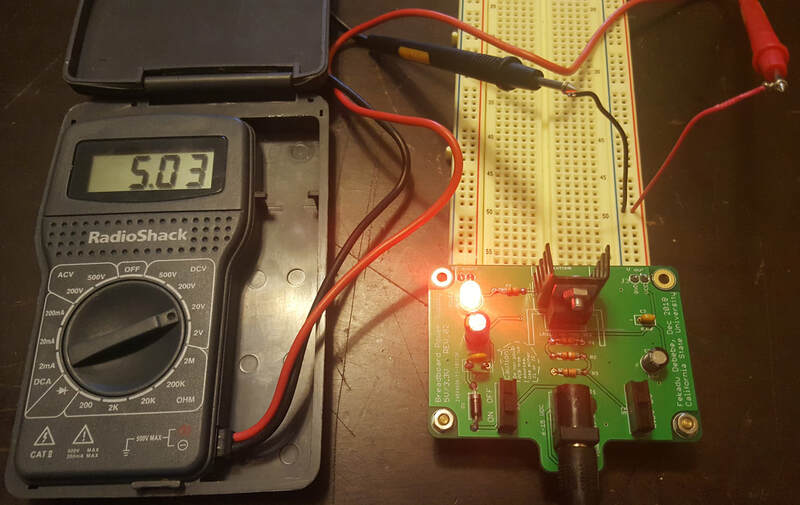 In this DIY project, we will design, assemble, and test a breadboard power supply that can provide regulated and selectable DC voltage. The Breadboard Power Supply (BBPS) will power a breadboard projects to either 3.3Volts or 5Volts regulated. For input power, the BBPS uses either a DC barrel jack as a primary input or stripped wires on the secondary input terminals. The BBPS can take 6 to 30VDC power from a DC wall wart and outputs 5V or 3.3V regulated voltage. 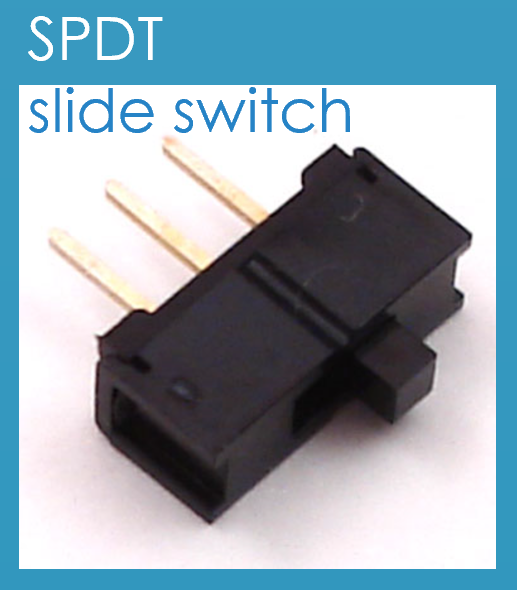 The user can select the desired voltage using a slide switch. 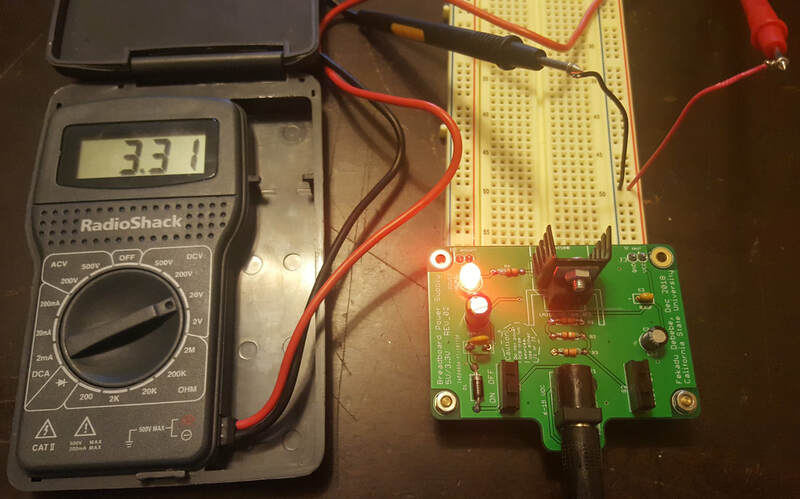 ​• Why 3.3 and 5V selectable power supply? Some microcontrollers use 5V as an Input Voltage and the GPIO from the board uses 3.3V as an operating voltage. 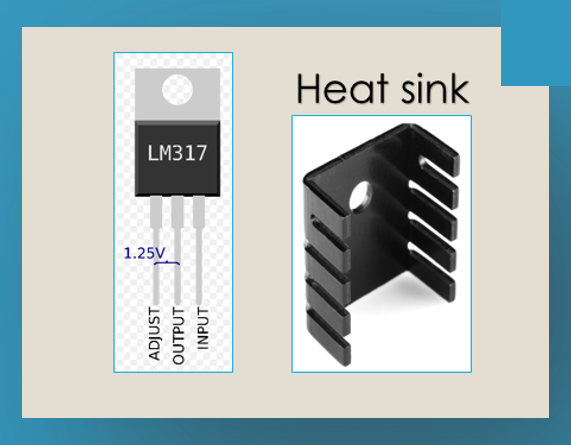 Whereas, most sensors are powered by 5V source and some are powered by 3.3 voltage source. Therefore, it is beneficial to have a power source with these two voltage levels. It is also recommended to use voltage level shifter if you are working with microcontrollers with 3.3V logic level like Arduino MKR 1000. 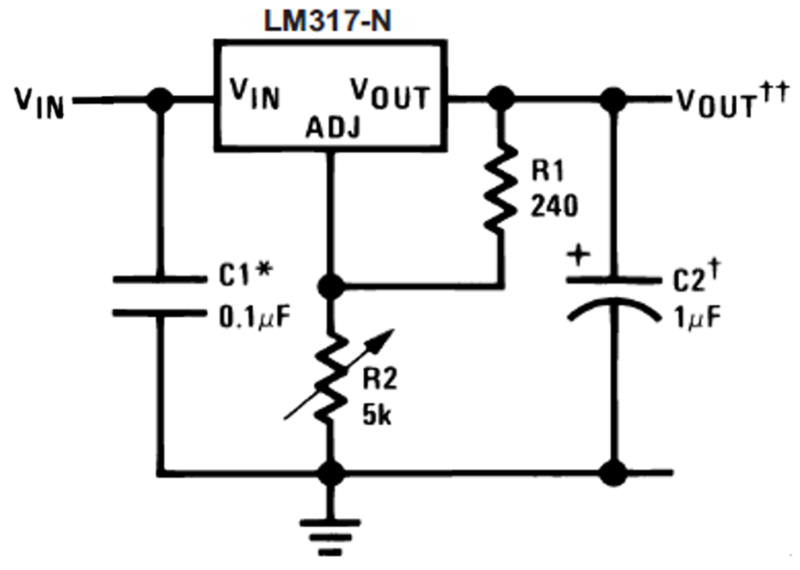 The application note of the LM317-N has provided a typical low-dropout voltage regulator application circuit diagram as shown in figure 2.​ If you want a variable voltage output with a potentiometer; then, you can use the circuit shown in figure 2 without any modification. •R2: variable resistor to get different output voltages. However, our design requires two voltage outputs, 5V and 3.3V instead of variable output voltages. Therefore, we need to modify the circuit in figure 2. Using the potentiometer or the variable resistor, R2, a variety of output voltages can be made possible. Similarly, we can create a voltage division circuit and a switch to replace the variable resistor functions in the above example. 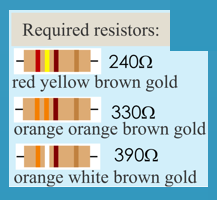 Based on the calculation, we need 330 and 390 ohm resistors for the voltage division and 240 ohm for the current limiter resistor, R2. Next, using the recommended values from the datasheet, the following capacitors were selected as shown in figure 3. - Bypass capacitor, C3 = 0.1uF to prevent ripple from being amplified. 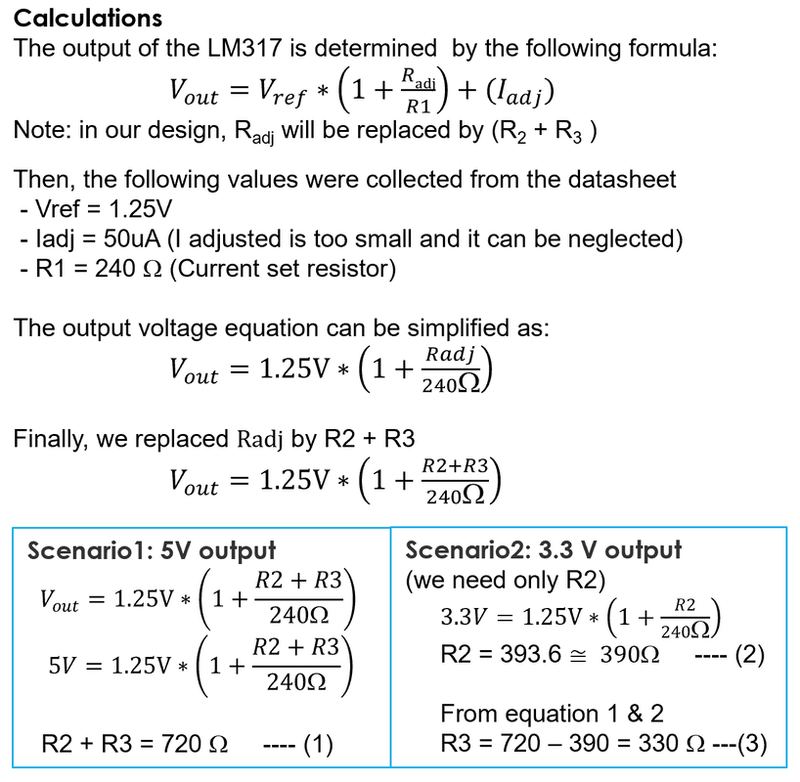 •R2 and R3: voltage division to get different output voltages. Finally, a voltage selector switch is added to the circuit and finalized the design of the regulated section. ​My initial design didn't have capacitor C2 and the percent error of the output voltage was much higher than this design. So I would recommend you to add the optional capacitor, C2. The unregulated section of the BBPS design added protection devices, switch and DC inputs devices. The circuit diagram for the unregulated section of the BBPS is sown in figure 4. Finally, the regulated and unregulated section of the design are combined. Then, an LED with a series resistor, 330 ohm was added for power on indication and the circuit design phase was completed as shown in figure 5 below. the current set resistor, R1 (240 ohm) in our case, must be placed as close as possible to the output terminal of the regulator to minimize trace resistance and maximize load regulation performance. Considering this information and the design requirements, the PCB was designed in Eagle-CAD program as shown in figure 6 below. After the PCB layout is completed, run both ERC (for electrical rule check) and DRC (for design rule checking). Note: ignore the "unconnected pin NC_1 and NC_2" ERC errors or approve these errors during check. These two pins do not have electrical connections, they are there for breadboard mount only. DRC check should say "No errors"
Then, generate a zipped Gerber file and send it to a PCB manufacturing company like OSH park, JLCPCB, or PCBWAY. I have used these three companies before and they are doing a great job. If you need a quick turnaround time, then OSH Park is preferred as they are located here in USA. If you want to trade in quick turnaround time for a cheaper price, then JLCPCB is the cheapest. If you need more quantity (10 PCBS) for the same price, then PCBWAY is the go to place. But do your due diligence to compare at least four or five companies to meet your pocket and quality requirements. In my case, version 1 was manufactured by OSH Park and version 2 was manufactured by JLCPCB, both PCBS have great quality but different turnaround time and price. The following parts, (except item number 15,16, and 17) are required to assemble the PCB. All the components listed in the pars list will be soldered on the PCB except the heat sink which will be mounted on the regulator using a screw and a nut. Besides, all the soldering work will be on the bottom surface of the board (components on top face of the PCB) except for the header pins. The 0.1" header pins will be assembled on the bottom of the PCB and soldered from the front face. Capacitor C1 and C2 are polarized and make sure the polarity is correct (minus sign is shown on the capacitor). Electrolytic capacitors must be forward biased and the positive terminal must always be connected to a positive terminal. Moreover, during soldering it is better to start with smaller components and then moving on to the larger ones. Having these in to consideration, solder all the components following the schematics. Then, install the two standoffs and nuts in order to support the PCB while one end is mounted on the Breadboard. The final assembly is shown in figure 10. 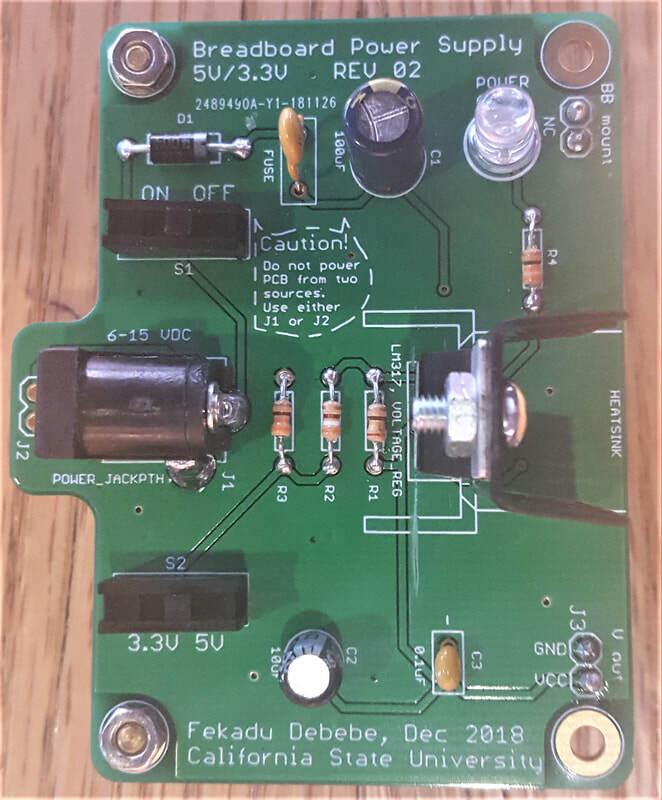 After all the components are assembled, double check the correct installation of all the components; especially, the polarity of capacitor C1 and C2. Then, it's time to plug it into the breadboard. Align the VCC and GND header pins with the power rails of the breadboard. The other two header pins will fit on the other side of the breadboard power rail. These two header pins are there for mounting purpose only and they don't have any electrical connection on the PCB. ​Then, connect any Wall Power Adapter from 6V to 15 V DC wall wart to the barrel jack. Next, turn on the On/Off switch and select either 3.3 or 5V via the switches. The LED should light on and the BPPS is ready for use. VCC and GND header pins will align with the power rails of the breadboard only in one direction. If the color code of the breadboard doesn't match the VCC and GND labels of the PCB then rotate the breadboard to full 180 degree. Now, we are ready to use the power supply but we have to test the voltage outputs of the BBPS. I my case, I have performed the output voltage test and both 3.3 and 5V outputs were successfully obtained from the BBPS as shown in the following figures.